There are 3 major costs which begin the costing process. 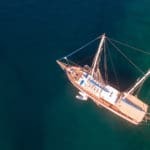 The charter price of the gulet. The drinks (soft drinks and/or alcohol). All other expenses are up to you and depends on your route. 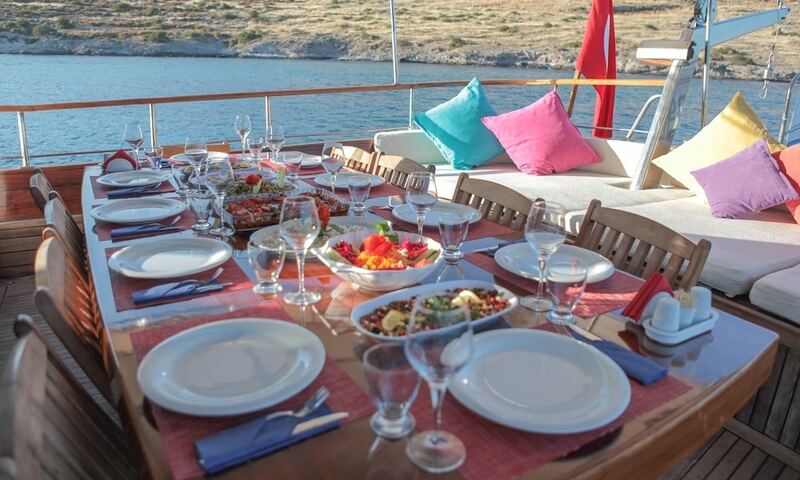 If you are considering Turkey or a Turkish gulet in Greece, then you do have the flexibility of bringing your own food and drinks on board. Most gulets will not charge a corkage fee. But this part is a bit tricky because for food, you do have to think about the crew. The best option is to let your agent do the shopping from the menu selection offered to you. Let the agent provision your boat. Food isn’t the only items that needs to be bought. There are also other supplies. It’s just how the system works. That way when you arrive you don’t have to think about whether you have enough or not and for drinks – well they will be just nice and cold for your arrival so you can get started on that amazing holiday of yours’. If you plan on sailing in Croatia or Montenegro, half board menus are mandatory. Full board menus are optional. You are either offered a set of different drinks packages or pay a corkage fee if you wish to bring your own soft drinks and alcohol on board – and the crew are happy to serve the drinks to you. Fuel for powered water toys, or the cost of using these toys available on board. 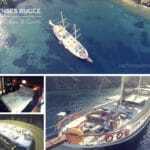 For gulets in Turkey travelling in Turkey and/or Greece it is mainly just the cost of fuel. In Croatia, it is either the fuel cost or the usage per hour for water skiing, donut rides and jet skiing, etc. Private marina fees – if you choose to moor in a private marina. If you don’t the boats do not go into the private marinas anyway. Therefore there would be no cost. In Turkey the municipal ports are included in the charter price. In Croatia and Montenegro, most boats charge extra for port fees. The costs depend on your route. So ask your agent for an approximate cost if the route is known. Other extras are airport transfers, tips for the crew (which is not mandatory), extra navigation costs if you go over the standard 4 hours (we don’t suggest going 4 hours at a time as you will be motoring a lot rather than enjoying those stunning destinations and the route may not be appropriate for this as well). Wi-fi is included to a certain limit. Usage over the bandwidth already offered to you is extra. Internet on boats are provided for checking your emails and not for uploading or downloading videos, music and movies. 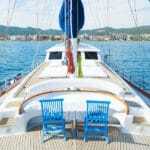 Greek island and customs fees are extra if you have hired a Turkish gulet, and sailing in Greek waters. Again this is a cost which depends on the boat, which islands you visit, and the number of passengers you are. There may be other costs which are not listed here that are specific to the boat. When you are costing, depending on the boat or boats you are interested in, do ask your agent – if they have not already given this information to you. Have questions? We have answers! 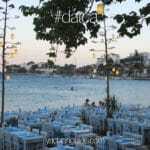 Feel free to contact us and let us know how we can be of assistance in planning your amazing gulet charter holidays.